One of the challenges in clarifying a post-theistic spirituality has to do with the fact that its principal concern – what I name the present mystery of reality – is impossible to define. While it is always and only right here, right now, any attempt to put a name and definition around it only manages to conceal the mystery under a veil of meaning. Our need for certainty might be temporarily satisfied, but in the meantime the curtain of mental tapestry has separated us from what’s really real. If we could acknowledge that this is what we’re doing, these veils would stand a better chance of parting before the mystery and facilitating a fresh encounter of our mind with reality. But while constructivism makes such an acknowledgment central to its method, orthodoxy, in every cultural domain and not only religion, cannot admit this either to its constituencies of believers or even to itself. Our mind has a tendency to fall in love with its constructions, to get lost in its own designs. Meaning is something we can control, since it is, after all, our peculiar invention. Mystery – not even “on the other hand” since this puts it on the same axis as meaning – requires an open mind, not one boxed inside its own conclusions. Our best constructs don’t amount to final answers but better – deeper, larger, and farther reaching – questions. In the meantime and as a consequence of this growing fascination with objectification, measurement, and control, we have gradually lost our taste and talent for a very different kind of narrative construction. One that doesn’t look out on a supposedly objective reality but rather contemplates the grounding mystery of existence itself. Myths have been around far longer than theories, and one of the early mistakes of science was to assume that these ancient stories were just ignorant efforts at explaining a reality outside the mind. Deities and demons, fantastical realms, heroic quests, and miraculous events – the familiar stuff of myths: such were not validated under scientific scrutiny and had to be rejected on our advance to enlightenment. Religion itself fell into amnesia, relinquishing its role as storyteller and settling into the defense of a supernatural realm above the natural realm, or (trying to seem more scientific) a metaphysical realm behind the physics of science. Otherwise, religion agreed to keep its focus on morality and the life to come. The theism-atheism debate is relevant here and only here, where the factual (i.e., supernatural, metaphysical) existence of god makes any sense. Theists insist that their stories are literally true and the mythological god is real, while atheists claim they are not, for obvious reasons. Theists profess the necessity of believing in god’s existence as a matter of faith, whereas atheists rightly point out that believing anything without the evidence or logic to support it is intellectually irresponsible. Post-theism provides a way out of this predicament by challenging us to put aside both metaphysics and physics as we reconsider these timeless myths. Their truth is not a matter of factual explanation but mystical revelation – or if you prefer, artistic revelation, precisely in the way a true work of art presents us with an artifact to contemplate and then draws back this veil on a present mystery. This mystery is the here-and-now experience that inspired the artist to begin with. As revelation, however, it is not a look at someone else’s past experience of the here-and-now but offers a spontaneous insight for the beholder into the deep mystery of This Moment. To show what I mean, let’s take the central myth of Christianity which has been summarized by orthodoxy in the doctrines of the incarnation, crucifixion, and resurrection of Jesus Christ. But whereas Christian orthodoxy has attached these exclusively to the historical figure of Jesus, that is to say, to a person in the past, we will regard him instead as an archetypal figure, as an instance of what Joseph Campbell named The Hero. As Campbell demonstrated, this Hero has ‘a thousand faces’ reflecting the divers cultures and epochs where his (and her) stories are told – stories that can be interpreted and understood archetypally as about ourselves. The Hero, then, is our ego, or the self-conscious center of personal identity that each of us is compelled to become. My diagram illustrates this journey of identity with an arching arrow representing the linear path of our individual lifespan. Personal identity is not something we’re born with, and its character cannot simply be reduced to our genes and animal temperament. Quite otherwise, identity must be constructed, and its construction is a profoundly social project involving our parents and other taller powers, along with siblings and peers who make up our cohort through time. Just as the Hero’s destiny is to serve as an agent of cultural aspirations (a struggle against fate), progress (a counter to the stabilizing force of tradition), and creativity (as an instigator of new possibilities), so does his or her path chart the trend-line and opportunities associated with our higher evolution as a species. Briefly in what follows I will translate the incarnation, crucifixion, and resurrection of Jesus Christ as representing three primary stages in the Hero’s Journey each of us is on. What I call the grounding mystery of reality is all that has transpired to bring forth our existence as human beings. This refers not only to the causal sequence of events leading up to us, but each distinct manifestation of the universe making up our present nature as physical, organic, sentient, and self-conscious individuals. From our position of ego consciousness we look ‘down’ into the ground of what we essentially are. 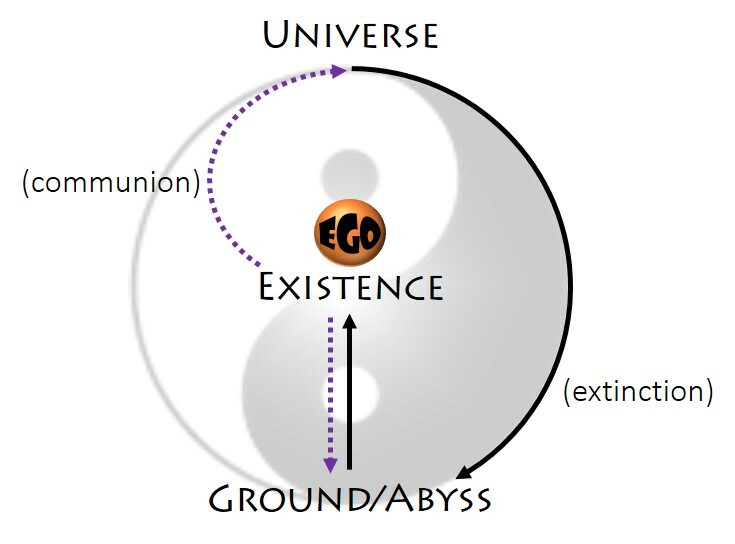 As mentioned earlier, it is our socially constructed center of separate identity (ego) that arcs in its journey out, away, and eventually back to the grounding mystery. Because personal identity is socially constructed and independent of genetic inheritance, the start of its journey is represented in the myths as something of a vertical drop from another realm. The Hero may simply show up, but frequently in myths its advent comes about by way of a virgin birth. Staying with this natal imagery, our best description would be to say that ego is spontaneously conceived (or ‘wakes up’) in the womb of the body. The longer process of ego formation involves the attachments, agreements, and assignments that conspire to identify us as somebody special and separate from the rest. Our tribe provides us (or so we can hope) with models of maturity, responsibility, and virtue, in the taller powers of adults who watch over us; but also in the construct of a personal deity who exemplifies the perfection of virtue. 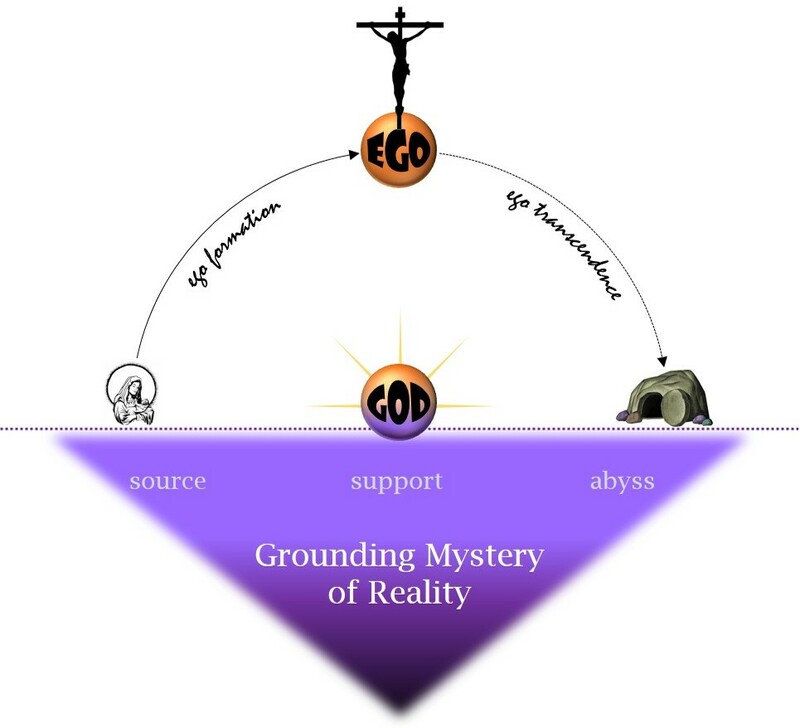 In my diagram I have colored the construct of god with a gradient ranging from purple (representing the grounding mystery) to orange (representing ego consciousness), in order to make the point that god is not merely another being, but the personified ground of being as well as the exalted ideal of our own waking nature. But at the very apex of ego’s formation, just as we come to ourselves as special and separate from the rest, another realization dawns: that we are separate and alone. In the heroic achievement of our unique individuality we also must somehow accept (or otherwise resign to) the full burden of our existence as solitary and mortal beings. As a narrative mechanism, the cross thrusts our Hero away from the earth but not quite into heaven either, where he hangs in a grey void of isolation, exposure, and abandonment. This is the crucial (‘cross-shaped’ or ‘cross-over’) point that can lead either to utter despair, a desperate craving for security and assurance, or to the breakthrough of genuine awakening. Which way it goes will depend on our ability to sustain this shock of loneliness and look not away but through it to a transpersonal view of life. It’s not a coincidence that Jesus’ followers recognized his cross as central to his vision of the liberated life. It was a visual depiction of his core message (gospel) concerning the necessity of dying to one’s separate and special self, whether that specialness is based in a felt sense of pride and superiority, or in shame and inferiority. Both, in fact, can equally fixate ego on itself and keep us from authentic life. Only by getting over ourselves can we enter into conscious communion with others and with the greater reality beyond us. Entering into the authentic life of a transpersonal existence brings us to the third stage of our Hero’s journey: resurrection. This isn’t a recovery of our former life but an elevation of consciousness to the liberated life, to what I also call our creative authority as individuals in community. In the Christian myth this higher state of the liberated life is represented in the symbol of an empty tomb, which plays opposite to the virgin womb as the locus of our Hero’s ‘second birth’, set free from the constraints of insecurity, ambition … and belief. From a post-theistic perspective, one gift of the liberated life is a grace to live in full acceptance of our own mortality, of the passing nature of things, and of the deep abyss in the face of which our most cherished veils of meaning dissolve away. In Spirituality Basics: The Human Condition I explored our situation as it comes together (or perhaps rather, falls apart) around the delusion of a separate identity known as ego. Insofar as our ego is insecure and driven by ambition to resolve or compensate for this insecurity in various ways, we end up in an even more neurotic mess. Our off-center and out-of-joint human condition is only aggravated the more (and longer) we insist on making everything about us, when who we are (as distinct from what we are) is merely a social pretense anyway. The delusion of our separate self gradually lightens into a general illusion of separateness, and this veil finally falls away before the revelation that All is One. Such a realization is the prized moment in spirituality, where the illusion of our separation from this, that, and the rest, as a necessary part of establishing a unique center of personal identity (ego), is transcended and we are suddenly disillusioned – or from the other side, reality is suddenly revealed (unveiled) to us as a vibrant Whole. This, and not the rescue project of getting the sin-sick soul safely to heaven after we die, is our true liberation. In the present post we will step into the picture just prior to this breakthrough realization, where we can also see it within the larger context of our existence. As my returning reader knows already, my point will not be that ego must be prevented from its conceit of having a separate identity, but that the project must be encouraged to the point where ego is sufficiently strong (stable, balanced, and unified) to be transcended. Otherwise, to the degree that we lack these markers of ego strength, we will be unable to get over ourselves and plug in to a larger experience. 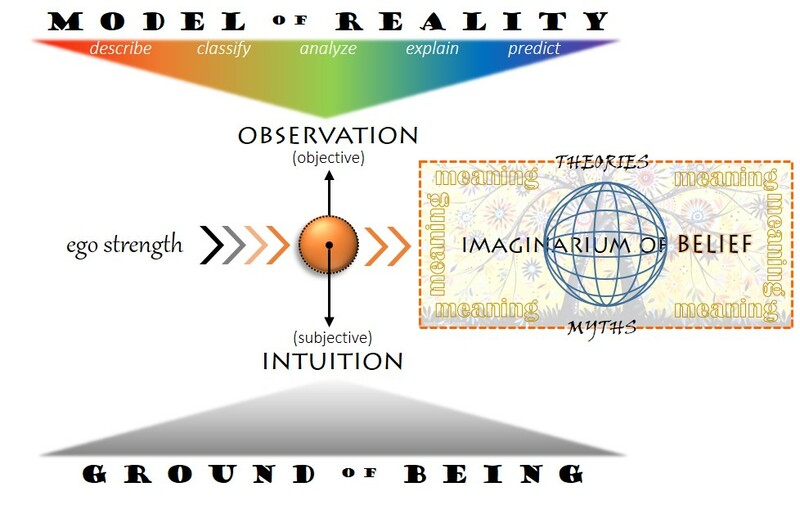 My diagram illustrates a simplified version of the Wheel of Fortune – that backgrounding model of reality appreciated in so many, especially premodern, cultures. The Wheel has long been a way of unifying space and time, origin and destiny, human and nature, inner and outer, self and other, life and death. Cultural myths were draped over its frame to provide orientation, inspiration, and guidance to human beings on their journey. When modernity cut the moorings of tradition and “superstition,” it not only emancipated the mind from archaic beliefs, but deprived it as well of this treasury of higher wisdom which we are ever so slowly rediscovering. Time will tell if we can recover it fast enough, and then take it to heart, before we destroy ourselves as a species. At the center of the Wheel is our individual existence, self-conscious in all its egoic glory. Much time, effort, and tribal investment has gone into the work of getting us to this point. Even before we come to self-awareness as a person – referring to the mask of identity that we put on and act out – we have already joined what the Chinese call “the ten thousand things,” where every individual is on its own trajectory from beginning to end. All together we are the universe, the turning unity of all things; and all together, but each in our own way, we are on a course to extinction. The aspect of reality into which all things eventually dissolve is named the Abyss. It is the dark chaos of pure potentiality as theorized by science, and the primordial dragon containing the energies of creation as depicted in the myths of religion, opened up by the s/word of a god and giving birth to the cosmic order. The great Wheel of Fortune turns, then, with each of us rising into existence – literally “standing out” on our own – and soon enough (or is it simultaneously?) passing away. It’s this passing-away part that ego struggles with, of course, since it seems to suggest that not only our houseplants but our loved ones, every last attachment, and we ourselves are impermanent. Many of us are motivated to grip down on our identity project, which compels a dissociation from the mortal body and a willful disregard (ignórance) of our better angels. So here we are, spinning neurotically off-center – except that it seems normal since everyone’s doing it – and estranged from our essential nature. The message of spirituality at this point is that we don’t have to stay in this condition, trying desperately to hold it all together while inwardly knowing it won’t last. It is at this moment of vulnerability that the veil of illusion stands its best chance of parting in disillusionment, where the present mystery of reality shines through and we really see for the first time. And what do we see? That our individuality is but an outcropping of a much profounder mystery that descends past our personality and through our nervous system; into the rolling rhythms of our life as an organism, and still deeper along the crystalline lattices of matter; finally opening out, dropping away, and coming to rest in the boundless presence of being-itself. Any of us can take this inward path to the Beyond-Within, but each must go alone. The wonderful thing is that once we let go of who we think we are, our descent into solitude removes, one by one, the veils of separation where aloneness has any meaning at all. We realize at last that everything belongs, we are all in this together, and that All is One. In this way, our descent into solitude is simultaneously an ascent into the experience of communion. What we name the universe, or the turning unity of all things, is therefore the outward manifestation of this self-same grounding mystery within. Our own personality, a unique expression of desire, feeling, thought, and behavior – along with all its peculiar quirks and idiosyncrasies – is what the universe is doing right now. But it’s not all the universe is doing, and everything doesn’t turn around us. Finding our place in the present mystery of reality is what spirituality is all about. We can now live the liberated life. The meaning of life is an ongoing construction project involving two parallel processes, communion and knowledge. Communion refers to an experience of no-separation, where your existence is felt as not just connected to but as “one with” the rest of it. The present mystery of reality rises into manifestation as you, but also as that other, which means that both (and all) of you express into form something which is itself formless. If that sounds overly mystical, then you should at least be able to agree that anytime you touch this thing or that thing you are touching the universe, since these (along with countless other things, both nearby and far-flung) are symptoms of a single universal event. Knowledge, on the other hand, presupposes a separation between you and the object you presume to know (or know about). Outside and all around you revolves that same universe, but now you are looking at the qualities that differentiate one thing from another, and you from the rest. Whereas your existence manifests the grounding mystery, it also participates in a turning mystery which includes you and everything else. From your vantage point, each thing is apprehended according to what distinguishes it and sets it apart. Gathering this information and representing it in your mind, then testing your conclusions by repeated experiences (or more rigorously by repeated experiments) is what we call knowledge. 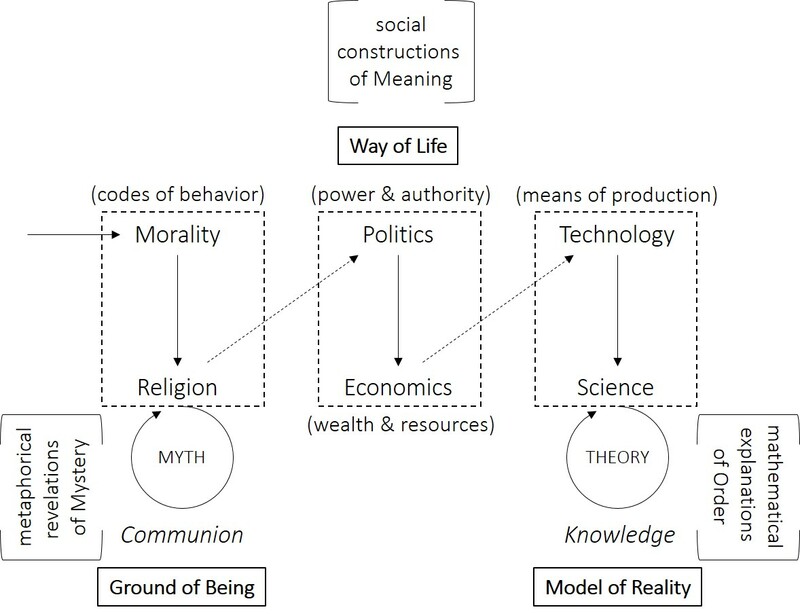 The construction of meaning involves both processes: (1) a deep sense of communion or oneness with reality, and (2) a conceptual representation of the objective qualities that distinguish things and allow for the classifications of knowledge. If this also sounds like the difference between spirituality and science, then you’re on to me. 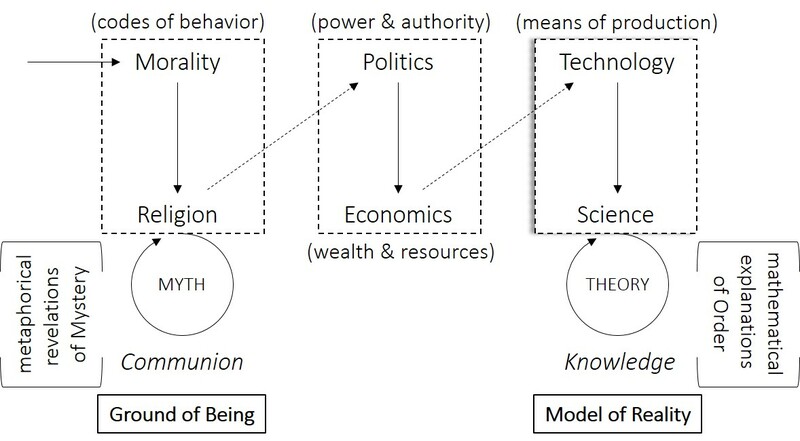 For the past several years, I’ve been building a case for regarding spirituality and science as inherently complementary, non-competing enterprises in our construction of meaning. They both tell stories – the myths of religion and the theories of science – but they are not telling the same kind of story. Myths are stories of communion, and theories are stories of knowledge. One constructs meaning out of a primary experience of oneness with reality, while the other constructs meaning as a system of explanations by which reality is increasingly known. As I tried to show in The Wheel of Fortune, a scientific theory of the primordial singularity that released energy into matter, and a religious myth of the primordial dragon whose dismemberment by a god formed the cosmic order, are not competing explanations for how the universe came to be. 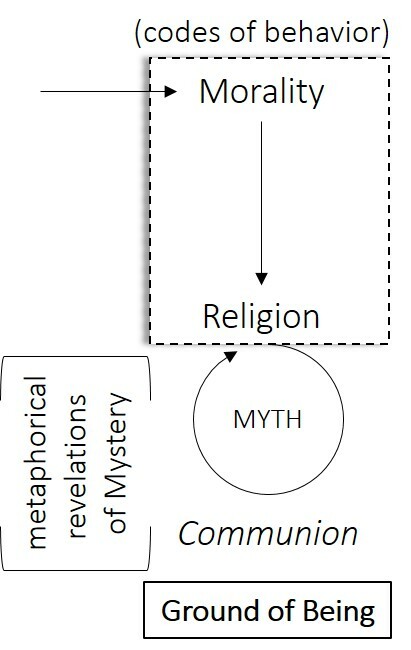 The theory is an explanation about how it came to be (a question of causality and evolution), while the myth is a revelation of why (a question of intention and purpose). Today’s science still doesn’t permit any serious consideration of intentionality in the universe, most likely because that’s the step which historically has put careless scientists on a slippery slope toward the necessary postulate of god’s existence. In fact, religious myths are not better explanations, nor do they require a belief in the objective existence of god. Myths are narrative tapestries constructed from the dramatic elements of setting, character, intention, agency, and outcome. They were designed for traditional occasions of sacred performance, when this veil (i.e., the tapestry of words and images) would be pulled aside and the community suddenly found itself in a universe awaiting their response. Scientific theories are not composed for sacred recital, and they don’t presume any kind of back-and-forth dialogue between human intelligence and the greater universe. Knowledge without communion produces something less than meaning, something meaningless, what Albert Camus in The Rebel named “the desperate encounter between human inquiry and the silence of the universe.” Camus’ nihilism was an understandable conclusion at a time (following the Second World War) when many had lost faith in human nature and hope for the future. The modern West has been bereft of a sense of communion for so long that we’ve grown accustomed to a feeling of homelessness in the universe. An exponential increase in our knowledge registry over the past 500 years has coincided with a steady decline in our general report on the meaning of existence. I’m not suggesting that while science sends us into despair, our only salvation is to believe in the objective existence of god, the immortality of the soul, or the literal realities of heaven and hell. The qualifying terms “objective” and “literal” indicate that what had begun as metaphors of sacred fiction are no longer appreciated as such, but have been pressed instead into service as referents to supernatural facts. Those who believe and defend their religion as an infallible source of knowledge are responsible for its inevitable degradation to a catalog of superstitions. Once again, the point I’m making is that spirituality – along with the form it takes in healthy religion – seeks to cultivate an experience of communion with reality, not knowledge about reality. The best analogue of this relationship between spirituality and science is the bicameral nature of the human brain. In fact, I will contend that our best way of overcoming the current impasse with respect to defunct religion and meaningless science is to consider what goes on in our brain on the path to maturity. 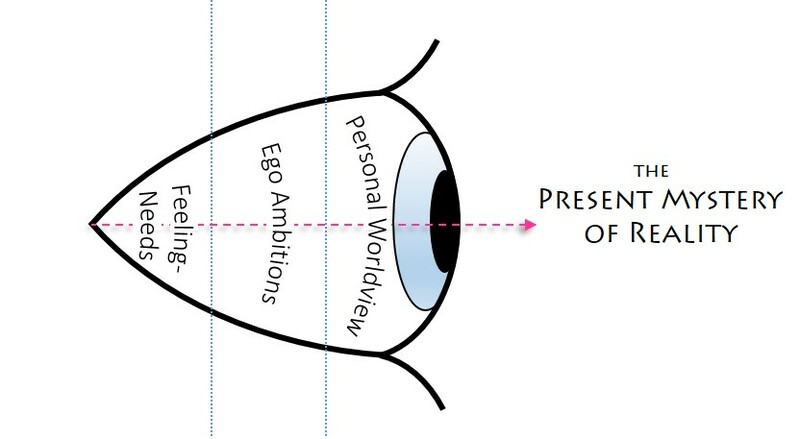 My diagram places a graphic of a brain at the center of the universe, the ultimate meaning of which is the shared project of spirituality and science (as earlier proposed). The right (peach colored) hemisphere corresponds to key terms on the left side of the picture, as the left (blue colored) hemisphere corresponds to the terms on the right – in the crossover of functions characteristic of our brain. The right hemisphere has more downward-projecting nerve pathways into lower (more primitive) brain centers and the body’s internal state. Consequently it is more “somatically gifted” than its neighbor to the left (from the Greek soma for body). It houses the neural anatomy (nerve nuclei, circuits, and networks) that facilitates our gut feelings, intuitions, hunches, and premonitions. Since our language centers are located in the left hemisphere, such experiences facilitated by the right are essentially ineffable (beyond words, indescribable, speechless). Developmental neuroscience discovered that from the time we’re born until about age ten our right hemisphere is dominant. This doesn’t mean that nothing’s going on to the left, but that our primary mode of engaging with reality is somatic – through our body, from our gut, more emotional than rational. As newborns our right hemisphere entrained with our mother’s right hemisphere to form the empathic bond that would serve as our secure base. 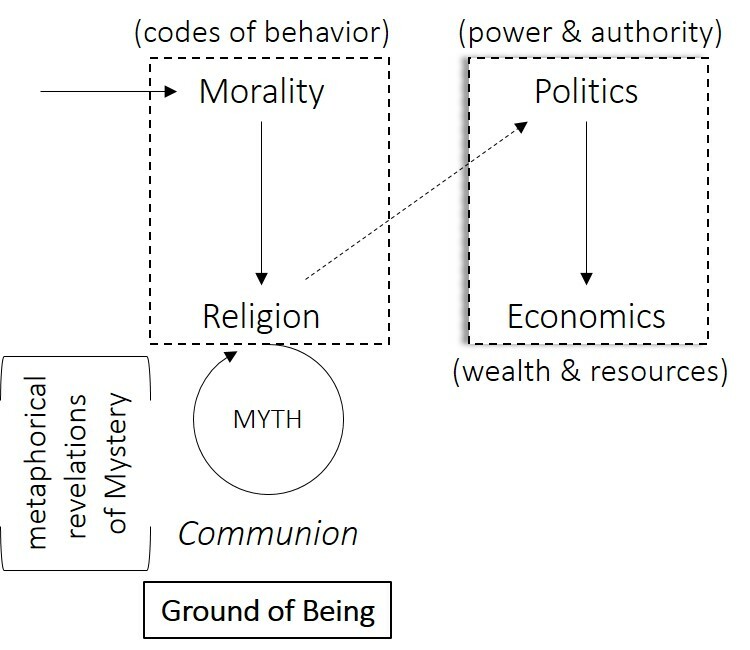 The experience of communion, and hence the inspiration of spirituality and many of the earliest, most enduring metaphors of religious mythology, has its roots in this resonance of brain and body (via the right hemisphere), of our body with our mother’s body, and still deeper into the rhythms of life, “Mother Earth” and the provident universe. Somewhere between the ages of 7 and 11, the average human brain makes a dramatic shift from the right hemisphere and into the left. The talents of our left hemisphere are semantic, focused in language, logic, analysis, reasoning, and rationality. Just as the right hemisphere communicates with, by, and through our body, the left hemisphere uses the conventions of language to participate in the collective mind of our tribe and culture. 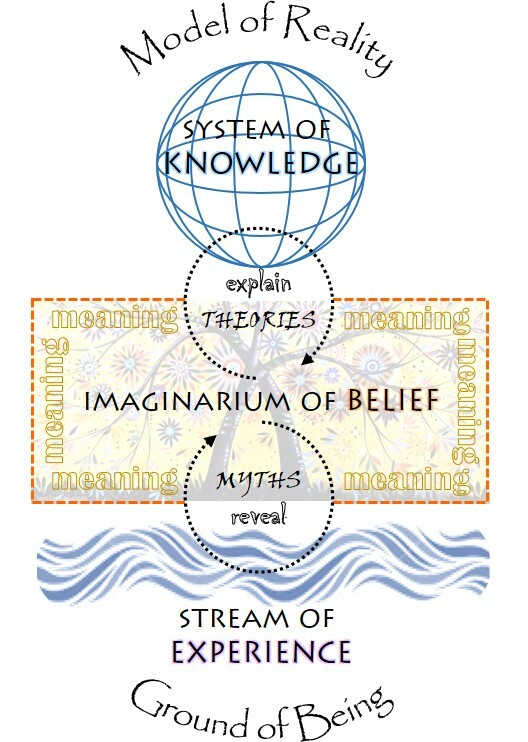 In this way we acquire a knowledge of reality that builds on the theories of others as well as on our own observations. That word “observe” helps to distinguish the strength of our left hemisphere from that of our right. Observation presupposes a critical separation between observer and object, a separation brought about by the right-to-left shift mentioned above – a shift away but not apart from the right. 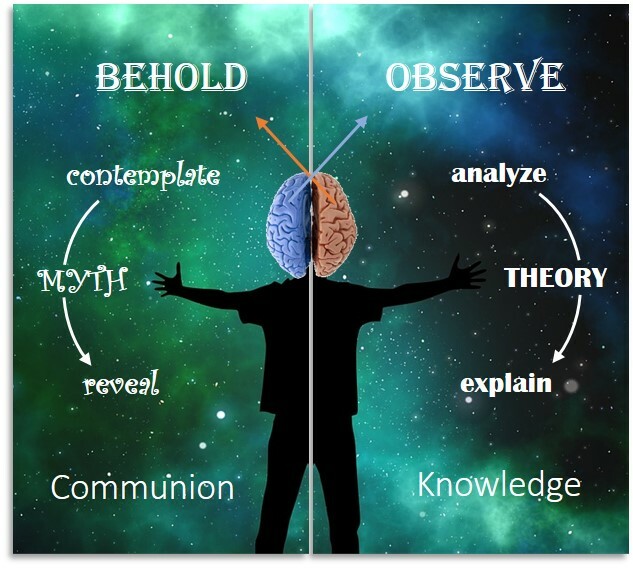 Our right hemisphere takes in reality from its unique position of communion with it, which is what is meant when we “behold” something. We don’t gather intel on a separate object with our five physical senses, but rather we grasp something by our sixth sense of intuition prior to its separation as an object. Our brain’s leftward shift can be mismanaged by culture (as it has in the modern West) into more of a severance, where the values of observing, analyzing, and explaining reality not only outweigh but drive out the right-sided virtues of beholding, contemplating, and revealing its mystery. I suspect that our Western conflict between science and spirituality – which, I need to stress, is distinct from that between reason and superstition, or between ethical responsibility and religiously motivated terrorism – is really the cultural manifestation of our failure to integrate the two hemispheres of our brain. What could (and would) be a normal developmental process of drawing an intuitive sense of communion with reality (right hemisphere) into our empirical knowledge about reality (left hemisphere), has instead collapsed into a sense of being adrift in an indifferent and meaningless universe. Our knowledge won’t ultimately matter – that is, it won’t support and enrich the meaning of existence – unless we can recover our communion with reality.